Come and join us for family fun on Sunday 9th July 3pm-5pm. 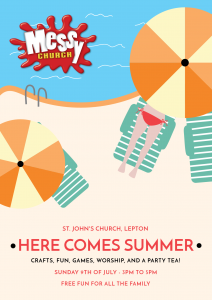 Crafts, fun, worship and a party tea – everyone welcome! Free fun for ALL the family! Check availability in this calendar and then submit your booking request on our hall booking page. 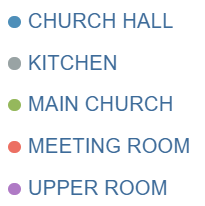 Please note that the meeting room may be used only for Church activities and fund-raising at the discretion of the PCC. It’s not available for hire. Discounted rates may be available to registered charities, St. John’s church members, and fundraising groups. Please get in touch to ask for further information.